Top Picture: You can see both feet. Bottom Picture: profile. The black in the picture are bones. You can clearly see her ribs (I think looks a little....creepy...SORRY BABY!). 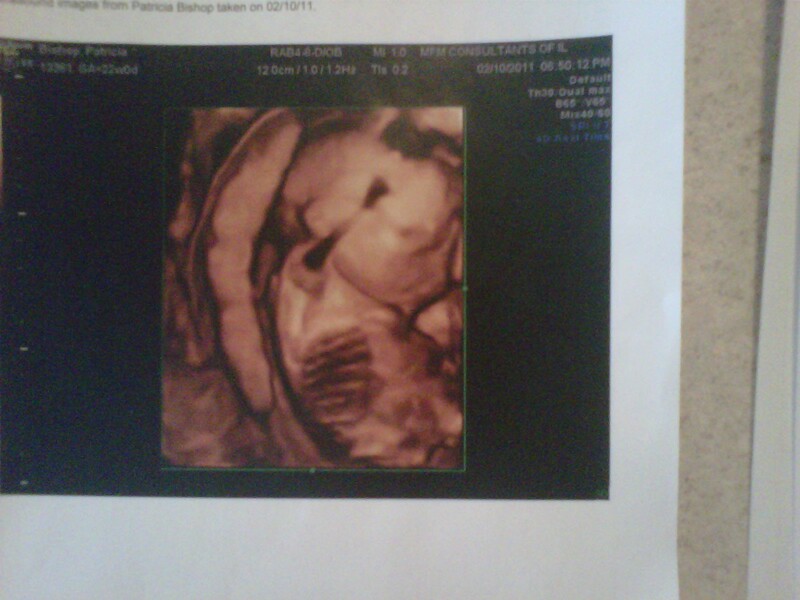 Her arm going up over her head, the black line is her humerus/upper arm bone. Her profile behind that. Her eyes are still fused shut, her mouth is closed and there's almost a little smirk on her face! These are the best shots they could get of our baby girl! We FINALLY had our ultrasound last night after the delay due to Blizzard 2011 last week! 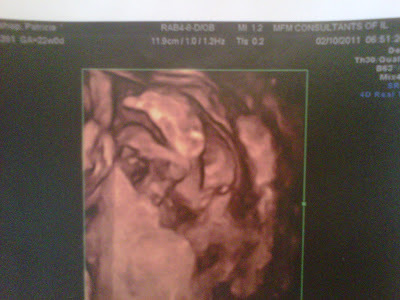 I think I was just a little too far along to get the money shots (she's kinda crammed in there), but they were able to see everything they needed to see to make sure she is healthy and developing well!! They saw no issues, measured her to be around 22 weeks along, that's 5 1/2 months (right where I should be), and about 1 pound! She wasn't too cooperative. I think it may be partly my fault, they think I may be a little dehydrated, so she was a little sleepy. She stayed curled up with her legs in what they called the pike position (see diver pose), arms over her head and facing away from the camera. The picture above they were able to get from above by pushing down into the top of my baby bump! This has been the most active child except for the 45 minutes we were in getting this done last night! She barely moved at all the entire time! Maybe she's camera shy like her mother. But with how she was positioned they got a clear shot of her spine and the back of her head which all look great! The only downside they said to not getting a clear face shot is they look for clefts in the lip and gum (they can't see the palate, Blake). Oh well, there's about a 0.1% chance that has happened and if it did, my family has been there, done that! We did get a video and I will try to put it on but I might need Brian to help. It's on a DVD and I'm just not sure how to do that. As with the pictures, she didn't cooperate much so it's hard to see. But we tried. Yesterday was nice and LONG getting ready for this. I did have my first girl dream the night before the ultrasound. I've been feeling boy all along, and have had 2 boy dreams. The night before this I had a dream we were in the ultrasound and the tech said "Welcome to the wonderful world of girls." I also think it bears mentioning that Santa was right! Again, I did NOT look pregnant when that man called it in the middle of the Jiffy Lube! I also asked Ben yesterday if he wants a baby brother or sister, he first answered "cookie." When I repeated the question, for the first time he thought about it and said very clearly "sister!" So, all signs! Ben's doing great! He continues to get more and more interested in the potty chair! We continue to dream that we will have even a brief break in diapering duties prior to baby girl being born. We'll see. He's initiating it more and more and we've had many successful trips! He's also becoming more and more funny! His imagination is taking off faster than I ever imagined! His favorite thing is taking a bite of his food then deciding what animal it represents. Or sometimes it's a boat, or robot. Just hilarious! He's also doing this thing on the way home from the babysitter where he makes an animal noise, and if I ask him a question he says "Not Ben! LION! Roar!!" Or "Not Ben! Horsy! Neeeeiiigh!!" Ok, I'll quite rambling and bragging about my children! We're all doing well! A lot of exclamation points in this one!! Once again, the Family Bishop pulled through! Not even a small little snowstorm can keep us down. 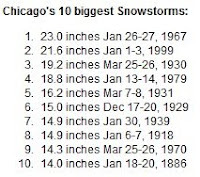 And by “small little snowstorm” – I mean the third largest Chicago snowstorm in recorded history. O’Hare Airport topped out at an official 20.2 inches (!!!) this afternoon, putting us right smack dab behind the 1999 storm. Well, “keep us down” is also a relative term – boy did it disrupt our week. The University of Chicago closed down for the first time in 12 years. Rehab Institute of Chicago closed for the first time EVER. But worst of all, Maternal Fetal Medicine was closed - we were scheduled to have the BIG ultrasound today. Girl or boy will have to wait another week. We’ll keep you updated. So, more about the storm: I was an idiot (as usual) and tried to drive home after work yesterday, instead of leaving early. I would have to say this was the worst driving situation I have ever experienced. I literally thought – maybe I should put my cell phone in my pocket. This way, I can still find it after I crash and call 911. It was THAT bad. Two and a half hours later, I made it back home – shaking terribly (Patti can attest to that). My car was encased in snow, you couldn’t see the car in front or beside you, and the snow ruts zigzagged across the road without rhyme or reason. And I was one of the lucky ones. Patti was smarter (as usual) – she left work early and made it home before the horrible stuff happened. It still took her 45 minutes for a drive that normally takes 10. We huddled - the three of us together – and listened to the thunder and lightning. Yes, it was a thundersnow – something I’ve never experienced before. Apparently, neither had this guy – The Weather Channel’s Jim Cantore! Yup, that video was from last night. Now here is some video from this morning! From right after 3 hours of snow shoveling – please notice how nice the driveway looks, and how darn huge those snow piles are. All me, baby! No plow service for us! Abby is having a time of it though – she won’t really go outside much since the snow goes over her chest in places. I pulled a “Marley and Me” and shoveled a path for her to go potty. She seems appreciative – I think. Ben is just happy to have both his parents home and doesn’t know this from any other day. Except he got to bake cookies, play in the snow, and keep his parents entertained all day. All in all, a bad storm, a bad drive, and a bad backache – but not a bad day. Any day spent with the family is good to me. Here’s to hoping that everything is closed tomorrow too!! !